What are we working on during AIG? A daily focus for all AIG students at Olive Chapel is the use of the 4Cs to develop unique student created products and dynamic classroom experiences. The 4Cs are an integral part of every lesson and activity at OCE. The 4Cs include Collaboration, Critical Thinking, Communication, and Creativity. The 4Cs are in many ways the embodiment of what we all need to be successful in school, at work, and as citizens in our communities. They are the solid foundation of good leadership and success in a global society. You can support your student in their own personal development of the 4Cs at home by talking with them about how they are using them each day. And how you use them as an adult at work and at home to be more successful. This year we will continue to utilize Google Classroom to enhance and transform our AIG classroom experiences. Google Classroom allows us to collaborate, create, communicate, and use our critical thinking skills more effectively. Students are able to use the devices in the classroom. We will work together each day on how to effectively use Google Classroom and how to be appropriate when online. Students will work on all Google Classroom assignments at school. If they have time, they are free to work on them at home as well. But, this is never required. The WCPSS AIG Program provides differentiated educational services that extend and enrich the Common Core State Standards by offering instructional and curriculum modifications that promote student engagement through challenging cognitive tasks designed to integrate and develop critical and creative thinking skills in the student's identified area(s) of giftedness. The regular education teachers and the AIG teacher work collaboratively to provide challenging, rigorous and relevant curriculum and instruction to accommodate a range of academic, intellectual, social and emotional needs of gifted learners. Curriculum connections are emphasized through overarching concepts, issues and themes. Differentiated curriculum and instruction in English/Language Arts (ELA) focuses on literacy including advanced content in reading, writing, listening, speaking and thinking. Differentiated curriculum and instruction in Mathematics focuses on advanced content in real-world, multi-step higher level thinking problems. consultation/collaboration between the AIG teacher and general education teachers. Click the link above to access the curriculum standards for each grade and other grade level curriculum resources. *explaining our thinking using writing skills and verbal communication skills. *What inspires writers to write poetry? *How do poets communicate abstract ideas, emotions, and truths? *What strategies do poets use to communicate important ideas? *How can word choice impact a reader's understanding of a poem? *How can I make my own poetry more powerful? These lessons included reading different samples of poetry, responding to critical thinking questions using Google Classroom, building background knowledge with poetry specific vocabulary, analyzing how authors use sensory details, and developing skills to identify and use language that makes poetry more powerful in their own writing. Students also worked through the writing process and created original poems using concrete and abstract ideas. *How is the process of researching helping me to become a better reader and writer? *How can I synthesize information from my research into a final product? *Why is the ability to summarize important to the research process? *Explain how "the work" of researchers, writers, and editors is connected and interdependent? What are they? Where do we find them? How do we read them? Students worked through a short unit that focused around reading and digging deep into different examples of technical texts. Students were presented with multiple project choices based on their current American Revolution studies in EL. Students first worked in team to choose a project that they were interested in and would also allow them to stretch their creative abilities. Next students dug deep into the project requirements and created their own rubric to help guide them while working. Their rubric work focused around creating specific details for their project elements. Class discussions focused around what exactly should be expected from a level 1, 2, 3, and 4 end product. After students completed their rubric they then went on to complete their project. Reflecting on the effort we put into our work and discussing how we can use rubrics to support us were key elements of success for the students. Students completed a data project that involved generating survey questions that yielded categorical data and numerical data. Each group chose a community employee to use as the focus for their project. Groups conducted research to determine what job responsibilities their chosen employee has each day at work and what type of survey their worker may need to administer. Once they finalized their questions they created a survey using Google Forms and administered this survey. Using the data from the survey responses they created visual models and analyzed it to determine if there were any patterns. Based on these patterns their group decided if there was a need for their community employee to make changes and then decided what those changes might be. Students have been tasked with designing a gallery wall of pictures for a very important client. Each design group has been assigned a room in the client's house and has been given a handful of pictures to use on the gallery wall. But, before they can decide where they go on the wall they must determine how to mat and frame each picture using their math skills. During this time they will also need to create a materials cost analysis for the client. At some point during this project the client will present each group with a TWIST that will cause them to make changes and create a different game plan. Will the client be happy with the designs plans? Will the group be able to work together to create their gallery wall? Students first worked to solve multiple digital breakouts that focused around their current math standards. 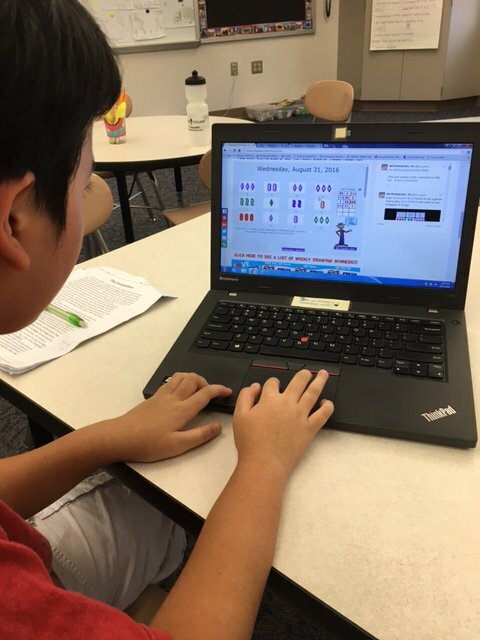 During the breakouts students had to apply their math problem solving skills to work through multiple levels of math puzzles to earn breakout codes. Once students were comfortable solving the breakouts they moved to the next level - CREATING THEIR VERY OWN BREAKOUTS! This was a very complex project. Students worked in small teams and brainstorm multiple breakout ideas and real world math connections. Students then worked to create their own breakouts using Google Forms and other Google tools. After all teams successfully completed their creations they shared them with the rest of the group. Solving each other's math breakouts was an incredible experience! Students researched and discussed places in history where human rights were/are in conflict. Specifically, they investigated people who were directly impacted by slavery and a lack of suffrage. Students researched the life and times of Henry "Box" Brown and Susan B. Anthony. They worked on student choice tasks to demonstrate their learning from their research. They used Google tools to create unique and original task projects that showed their growing knowledge of the importance of the need for different human rights in our world - past and present. Student will work their way through a Jacob's Ladder text using Socratic Seminar. In our Socratic Seminar, students will help one another understand the ideas, issues, and values reflected in our text through a group discussion format. Students are responsible for facilitating their group discussion around the ideas in the text; they shouldn’t use the discussion to assert their opinions or prove an argument. Through this type of discussion, students practice how to listen to one another, make meaning, and find common ground while participating in a conversation. Students have been tasked with creating their very own Ted Talk about deforestation. Through the process of creating their Ted Talk the students are trying to persuade others to gain a better understanding of deforestation and take action via one possible solution towards making an impact on that problem. Students are busy researching a leader of their choice who has advocated for change and in turn made a positive impact in our world. During their research students are considering the factors that contribute to social change and how these connect to their leader. These factors include different life events and specific examples of how they lead and call for change in our world. Their research includes discussing different leaders of social change and the different awards that have been given to leaders who do great things. Using the information gathered during their research students will create a unique award for their chosen leader to receive. They will design this award using Google drawings and other other Google tools. Then, they will write a speech presenting their award to their leader. They will then write an acceptance speech from the point of the view of their leader. Students completed a data project that involved generating survey questions that yielded categorical data, numerical data, and data that changes over time. Each group chose a community employee to use as the focus for their project. Groups conducted research to determine what job responsibilities their chosen employee has each day at work and what type of survey their worker may need to administer. Once they finalized their questions they created a survey using Google Forms and administered this survey. Using the data from the survey responses they created visual models and analyzed it to determine if there were any patterns. Based on these patterns their group decided if there was a need for their community employee to make changes and then decided what those changes might be. Students are busy working on creating their unique pool designs for a brand new aquatic center. Using a set of pre-determined criteria each group is working on creating 3 different pool designs using Google Drawings. The students main focus is to apply their knowledge of volume and work as a team using Google Drawings during this project. Students are busy working on creating their unique pool designs for a brand new aquatic center. Using a set of predetermined criteria each group is working on creating 3 different pool designs using Google Drawings. The students main focus is to apply their knowledge of volume and work as a team using Google Drawings during this project. Students are busy applying their knowledge of multiplying and dividing fractions using models. They are doing this by analyzing errors from sample student work. Students are working in teams to analyze the story problems, the student work that accompanies them, and the errors that have been placed inside the student work. Students are then extending their thinking by writing about the mistakes and explaining how they would fix them. It's a tricky assignment to find someone else's errors, but boy is it providing some great math discourse! Teaching: All third grade students participate in whole class and small group Explorers lessons throughout the quarters. These lessons are facilitated by the AIG teachers with the support of the general education teacher. Also, AIG teachers collaborate weekly with all third grade teachers to support them in creating and facilitating differentiated activities for our students who demonstrate high capabilities. Testing: During the first quarter all third grade students take the CogAT tests. Once the school receives the score results back the School Based Committee for Gifted Education (SBCGE) analyzes them and determines who is eligible to take the Iowa tests. Students who have any CogAT score in the 85th percentile or higher are automatically eligible for Iowa testing. Students who do not get this score are still able to be recommended for testing by teachers or parents. A written nomination is needed for this. Iowa tests are typically administered in late November and results are returned to schools by late December. Teaching: AIG teachers work with the third grade teachers to create small groups for more Explorers lessons. The students are chosen based multiple data points and their ability to demonstrate higher capabilities than their peers. These groups are flexible. The lessons used are created using third grade curriculum standards, district resources from the AIG department, and with input from the general education teachers. AIG teachers continue to collaborate weekly with all third grade teachers to support them in creating and facilitating differentiated activities for our students who demonstrate high capabilities. Testing: Once the school has received all test results (CogAT and Iowa) back from the testing office the SBCGE meets to determine which students need additional testing. Additional testing is determined using the AIG gateways. CLICK HERE to access the gateway requirements. (Please note, the district office sets all AIG gateways and testing requirements.) All additional testing is completed during quarter 3. During this quarter the identification process for third grade students is completed and qualifying students are identified as AIG using the gateways. Teaching: All students that are identified as AIG begin receiving direct services from the AIG teachers. This includes 1 small group lessons each week - in each identified area. AIG teachers continue to collaborate weekly with all third grade teachers to support them in creating and facilitating differentiated activities for our students who demonstrate high capabilities. Testing: There is no AIG testing required for third graders at this point in the school year. Why are the world's natural resources threatened? How can we persuade others to take action to contribute to a better world? Students will expand their current knowledge of how our world's natural resources are being threatened and why we should be worried to the point of calling for change. The essential questions listed above will help guide their thinking as they read through multiple NF and F texts. Students will work on taking notes from the texts and becoming experts. They will then create a short expert presentation using their notes, their team, and Google tools. During this time students will also be working to become more effective digital communicators and collaborators when using our Google classroom. Students will work on creating evidence based responses in Google classroom during their research. They will practice typing up short responses to different types of questions in our class comment thread. They will analyze their teammates responses and generate a list of expectations for solid, evidence based responses. Step into the life of an AIG student by viewing the pictures below. Each picture is accompanied by a caption underneath it. Enjoy! 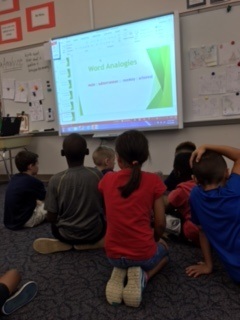 AIG students love analyzing word analogies! They work in teams to discover the connections between words by sharing their prior knowledge. Some of our second graders are able to create their own examples and explain them to the whole group! AIG students work in small groups to see who can conquer the daily SET game on the Wall Street Journal's game page. It's all about your visual perception - have you tried playing? Try it! 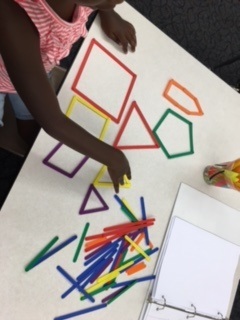 AIG Math students explore shapes using AngLegs! These hands-on pieces allow them to create many different sized shapes. After much creation they will write about their shapes using describing words and complete sentences. Congratulations! 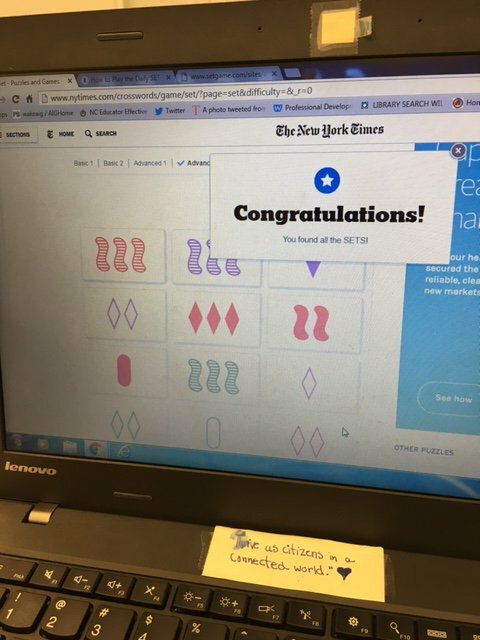 A group pulls out a win after conquering the daily SET game on the New York Time's webpage. This win was a mix of visual perception talent and good, clear peer communication. Kudos to all the teams for their efforts! 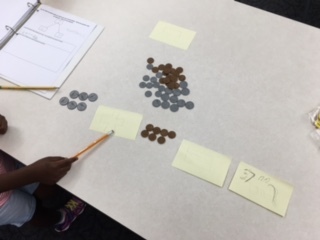 AIG students explore the connection between addition and subtraction using coins! This student was able to create her own story problem using math mountains and coins. When she finished her story she asked to use a calculator to add up all the money she had used. What a great activity that used a few different real world skills!